Also, I personally think it looks badass. Especially with yellow lenses. And with that classic Brumos Porsche livery. And with black wheels. This particular 996 GT3 RS was run at the Barber 250 Miles on October 10, 2004, qualifying in a lowly 37th out of 39 entries. However, after the checkered flag, Gunnar Jeanette and Marino Franchitti sat in a much more neat 13th overall, and 4th in the GT class. The model is a 1:43 by Minichamps, and is a little up and down for me. Great points are the wheels, with nicely detailed brake discs and tire lettering, and they roll great! Not as important for a 1:43 of course, but still good to know for those potential panning shots. The headlights are great, the tow hook out back is nice, and overall the fit and finish is very good. However, the white paint is laid on a little thick, making it seem like there are no door panel gaps, much like a NASCAR. 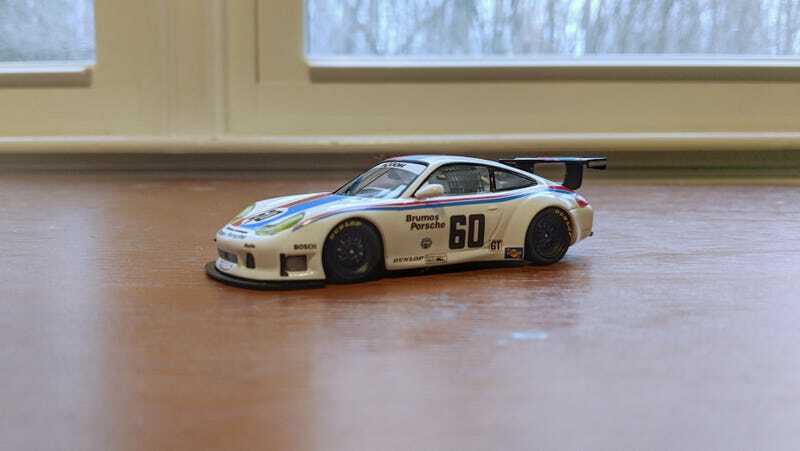 I can’t complain too much, though, as I got it for a very decent price, and it’s a great addition to my slowly growing Porsche-racecar-in-1:43 collection. Sorry for the crappy photos, I didn’t really get a good opportunity yet, but still wanted to put up a TT post... I’ll make sure to do a re-shoot soon!